I don't think anyone is going to argue the point that the kit lens that comes with the APS sized sensor Canons is a great lens. It's cheap and does an OK job but even if it was tack-sharp it would not be my ideal walkabout lens. I need a bit more reach on my photo haunts so the first lens I hunted down after getting the kit lens and the 50mm f1.8 (undisputed bargain king) was the 28-105mm f3.5-5.6 USM lens. The 28-105mm gave me the reach I wanted and the quality I was looking for for a good price ($140 secondhand from Craigslist). It felt more solid and more like a lens should and yet was very compact and useful. I was happy with this lens for a couple of years and then a friend of mine, with more disposable income than me, decided to go traveling for 12 months and decided not to take his 24-70mm f2.8L lens with him so I had this classic and legendary lens in my own camera bag and at my disposal for a year. It's a great lens even though it is expensive and heavy, and is ideal for portrait and low-light work. A year with a borrowed lens flies by and it wasn't long until I had to return the beautiful L-series glass. Going back to the old 28-105mm f3.5-5.6 was slow so I started to look around for a more affordable alternative to the red striped lens. I looked at the third party manufacturer's 28-75mm f2.8 offerings that cost less than $500. They are tempting and I may get one as a portrait lens in the future but as a walkabout lens they are just a bit to limiting for me. The 24-105mm f4L IS looks great but was out of my price bracket. This left only one real choice; the Canon EF 28-135mm f/3.5-5.6 USM IS ($270, again secondhand from Craigslist). 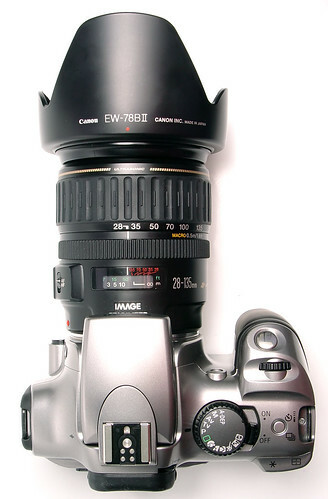 It's an older designed image stabilized (IS) lens but the IS still gives you a stop or two extra hand-holding ability. Compared to my old 28-105 it is huge; compared to the 24-70L it is small. It is pretty solid and heavy with professional features like a metal lens mount, focusing scale and a full-time, manual focus ring. On the other hand, it has more consumer like composite construction than the L-series' metal rigidity. It's plastic nature is sometimes noticeable with the zoom ring being a little staccato at times, especially when compared to the L-series' liquid fluidity. All in all, construction is enthusiast-solid, not professional-rock-solid and not consumer-plastic. Comparisons in the image quality department are similar. The 24-70mm is legendarily sharp so it seems a little unfair to compare the 28-135mm with it side by side. When removed from the Pepsi taste challenge, images from the 28-135 are impressive. I had read line-counters who claim it is marginally sharper than the 28-105 but the difference is so marginal that I could not notice it in real world situations. So why upgrade then? The IS really works. If, like me, you can't afford the f2.8 but sometimes find yourself in light that demands that speed then the IS is there to help you out. Not that IS is a total substitute for f-stop speed, it can't stop motion blur just camera shake, but does help. Actually, it more than helps. IS can become a bit of an addictive crutch. Pick up any other lens and you start to wonder why your pictures are soft hand holding 100mm at 1/30. That extra 30mm of reach comes in handy too when you're out and about. In a full-frame equivalent world the lens behaves like a 45-216mm zoom; that's a standard lens to a pretty decent telephoto. It's not going to pull in wildlife from far away, or be wide enough for many street or architectural photographers but in that unfashionable focal range between the two it is very useful. It has become my default lens; the one that's on the camera 75% of the time. It's not perfect but every lens is a series of compromises. As compromises go, the 28-135mm is a pretty good one. My standard zoom conclusion? 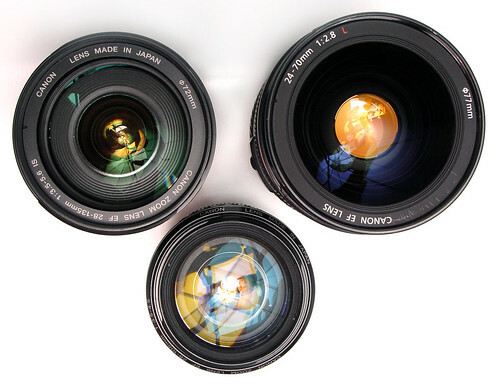 If the only lens you currently own for your Canon is the kit lens and/or the 50mm prime and money is an issue (isn't it always?) 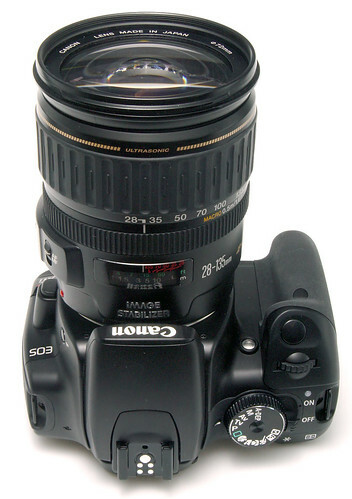 the 28-105mm f3.5-5.6 is a pretty good bargain (currently $230 at Adorama). Just make sure you get the f3.5-5.6 not the cheaper f4-5.6 or you may be sorry. If you already own the 28-105mm is it worth stepping up to the 28-135 (currently $410 at Adorama)? If you need a little more flexibility in low-light, then maybe, but if you use it mainly outdoors during the day, perhaps not. I leave formal lens tests to men with more free time than I have but to my eye there's not much in sharpness, contrast or color accuracy between the 105 and the 135. If portraits are your main thing but the 24-70L is a bit spendy check out something like the Tamron 28-75mm f2.8 ($370 at Adorama). If I had a grand or more burning a hole in my pocket I'd get the 24-105mm f4L IS for sure. Until that day the 28-135 works for me.